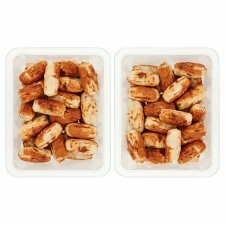 Oven baked British pork sausages. 60 sausages made with outdoor bred British pork. Succulent sausages with a coarse meaty texture. These sausages have been baked not fried. Pork (85%), Rusk, Salt, Dextrose, Parsley, Sage, White Pepper, Nutmeg. Filled into UK or non-UK beef collagen casings. Rusk contains: Wheat Flour (Wheat Flour, Calcium Carbonate, Iron, Niacin, Thiamin), Raising Agent (Ammonium Bicarbonate). Keep refrigerated., Once opened, consume within 2 days and by 'use by' date shown., This product may have been previously frozen and has been restored to chill temperatures under carefully controlled conditions., Defrosted: It is not suitable for home freezing. Instructions: For best results oven heat. Place on a baking tray in the centre of a pre-heated oven for 12 - 15 minutes.